Best artificial tree I’ve ever had. Fooled everyone it is so lifelike. Easy to assemble- perfectly lit- perfect size- easy to disassemble and pack til next year. Researched hard to select this and it did not disappoint! Light up your living room this holiday season with this artificial Christmas tree. Gone are the days of tangled light strands, as this lighted Christmas tree comes integrated with 1,000 clear lights. 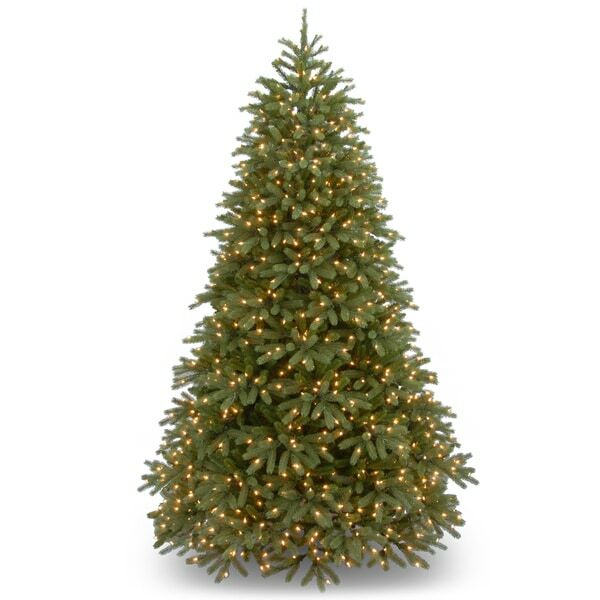 Constructed with a hinged metal base and plastic synthetic-fiber branches and pine needles, this tree is both fire resistant and hypoallergenic, and it's easy to set up and take down. The tree is ok, but not worth the money. Took a lot of time to make it look nice and still a little disappointed. Branches on the outside are decent but near the trunk of the tree is pretty empty and the materials used are very low quality. I like the shape because it's just right. Not to wide and not to thin. The lights are pretty and spread out evenly. This Christmas tree is very, very well made. Very realistic! The quality is excellent!! The price for this tree is unbeatable. The branches are full and lush. What a great buy!! Very easy to assemble. Love the way it looks!! This tree is beautiful. I haven’t had an artificial tree in over 20 years, so I was nervous to buy it sight unseen. It takes awhile to “fluff” the branches out. It is a good size. It is not as full as the picture but once I really fluffed the branches and put my ribbon on it looks lovely. And it is bright!! Plenty of lights. Easy to put up. Looks so real. Plenty of lights. Love it! The tree was not as full at shown....lots of spacing between the branches. I didn't count the lights but it does NOT look like there's a 1,000 lights. Not worth the price. "What's the coverage of "feel-real" branches? Are these branches only on the ends or they cover all the way inside???" Hello 2355il, thank you for your inquiry. Unfortunately, the information you have requested is currently unavailable. We will continue to try and answer this for you. You will receive an email notification once an answer is posted. Have a great day. "Please describe construction...is it 3-piece construction? Easy to assemble?" Hello patsy16, the assembly is very simple, you will need to attach the tree together and place it on the stand. I hope this helps, have a good day! "how are the branches assembled to the tree? And the lights? What does the warranty include?" Hello vandoj, thank you for your inquiry. Unfortunately, the information you have requested is currently unavailable. We will continue to try and answer this for you. You will receive an email notification once an answer is posted. Have a great day.